The picture is entitled 'Tiny Forest of Metal Trees’. 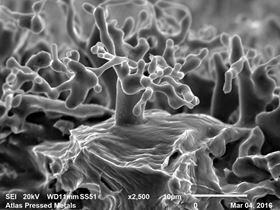 The photo, taken by Dr Craig Stringer, senior metallurgist at Atlas Pressed Metals, is entitled 'Tiny Forest of Metal Trees’ and won the monthly photo contest at Jeol, a US supplier of electron microscopes. It was taken using a JSM-6010PLUS/LA electron microscope. This story is reprinted from material from Atlas, with editorial changes made by Materials Today. The views expressed in this article do not necessarily represent those of Elsevier. The MPIF has concluded its judging of parts submitted to its Powder Metallurgy Design Excellence Awards competition.